Your average Viking man or woman would have considered themselves seriously underdressed if they didn't have some nice decorations on their clothing, probably including tablet woven bands. Tablet weaving was also very popular with the Anglo-Saxon peoples. Historic techniques and patterns are different from those developed by crafts enthusiasts in the 19th and 20th centuries as they 'rediscovered' tablet weaving. In the article below, I examine tablet weaving from a Dark Age re-enactor's point of view, including the history of the craft, techniques, motifs, regional variations, materials and tips to help the weaver. There is also a section discussing Anglo-Saxon weaving across the Dark Ages. My intention is to give the reader an overview of the characteristics of Dark Age tablet weaving and to help them either weave or buy bands that are suitable for re-enactment use. This document was produced by a team within The Vikings re-enactment society. It is not official society policy but I think it is a good starting point for anybody wanting to know what narrow weaving, plaits, cords etc. are suitable for a Dark Age re-enactor, with pictures and references. The guide briefly covers materials, tools, techniques and usage. Of course new material and opinions will come to light and I'm keen to update this document as required. I always used to begin by teaching people how to make "threaded in" patterns, but in this article, I've started with "woven in" patterns. This is partly because I think it is actually an easier way to begin, and it certainly makes threading up quicker, but also because I have since learned that "threaded in" patterns are quite a modern development. As far as I've been able to find out, almost all the tablet-weaving from earlier times (from say the Bronze Age up until late medieval times) was made using "woven in" techniques. Starting with woven techniques gives a greater understanding of the process and leads the weaver naturally on towards more advanced and more authentic techniques. There are a few threaded in patterns from early tablet weaving, including the Saxon Threaded-in Weave shown on Mistress Thora's excellent site and the narrow Oseberg band. Instructions to weave these, and other historical bands, can be found on my Patterns from the Past page. If you do try to learn tablet weaving from my article, I'd love to hear how you get on! In particular, please let me know what you found confusing, so that I can try to improve it. In his seminal book "The Techniques of Tablet Weaving", the great weaver Peter Collingwood described several traditional tablet-weaving looms from various countries. One of these is on display in the Pitt Rivers Museum, Oxford, having been bought from a Jew in Tunis in 1914. I have written up some notes that I made after seeing this loom in the museum. 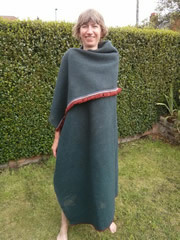 Drawing on techniques used by the Anglo-Saxons in the Relics of St Cuthbert, I wove a fringed band and then used a two-tablet band as a link to sew it to the edge of a cloak.